Scranton Orthopaedic Specialists came to BlackOut Design recently for help introducing its newest staff member to the community with a newspaper advertisement. BlackOut delivered a refined and distinctive ad that speaks to Scranton Ortho’s reputation for high quality, professional services. 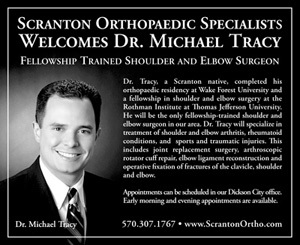 The advertisement ran in newspapers throughout NEPA, announcing Dr. Michael Tracy’s arrival at Scranton Orthopaedic Specialists with a style that is unmistakable.